Hmmm? 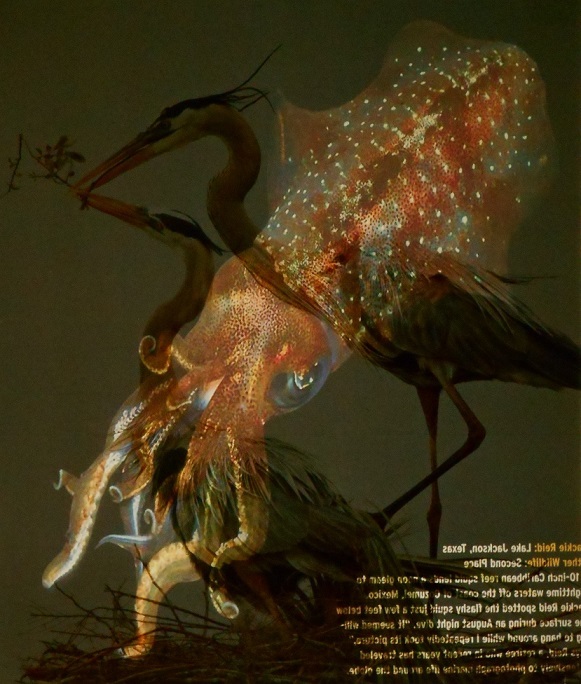 A ghostly translucent squid seems to hover in midair between the viewer and nesting herons. Did I superimpose 2 images to create a (clumsy) visual metaphor about the interconnectedness of life? Nope. The story begins millions of miles away, where the sun emits photons even more copiously than the pols emit factoids. Minutes later, a tiny fraction of the photons bounce off a neighbor’s window, pass thru my window, and hit me in the eye. There are many ways I would love to emulate people like Bach or Galileo; going blind is not one of them. bought me as a decoration. Ha! Of course, I am dissing only the decals I have seen, not any other decal U may have and like. The Dec/Jan 2016 issue of National Wildlife magazine has photos from the annual NWF photo contest, including a photo of nesting herons by Mario Labado and a photo of a squid by Jackie Reid. I read the magazine on paper (yes, I am that old), and it so happens that the photos are on opposite sides of the same thin sheet, w/o much else to clutter what is seen when bright light passes thru. The fraction of duplex printed sheets that look at all good when both sides are seen at once is like the fraction of photons emitted by the sun that bounce off my neighbor’s window: tiny. So I cut out the sheet and taped it to my window. The image of the squid is actually on the far side; the illusion of being closer than the herons is the same in my house as in my photo. The composite image is indeed clumsy as a visual metaphor for the interconnectedness of life, but it does tone down the excess sunlight. It cost nothing beyond what I already spent to help support the NWF, and it looks better than a barfing warthog. Very clever. I would never have realized the image of the squid was on the far side. I appreciate your interest in photography and creating perspectives not typically seen. It adds interest and makes your photography more thought provoking. This is really really cool. One, that you taped up the picture and then sometime later I suppose noticed it for what it was instead of just looking at it as a photon blocker. (I guess that’s the serendipity part). Two, how you bring it back around TWICE in the same short story (tiny fraction of photons and warfing barthogs). By the way, I have a cool decal on my window so I appreciate the qualifier. Makes for a very intriguing picture. And it opens up a whole new avenue of photography!